Well that is such a great picture to see this morning. The cats do love tall grass. Sandee, you and Zane have a most wonderful day. That kitty is awww...worthy :)Have a great day! That awwww is one step away from attack. Awww. cutie in the grass. Oh my goodnes. That kitten is adorable. Enjoy your Monday Sandee & Zane. See ya. Too sweet for words. Thank you for the Awww this morning! oh what a sweet kitty!!!!!! Thank you for linking to us! Have a most pawesome week!!! xoxoxo We love you! Hard to believe this adorable kitty is cousin to a tiger. I always forget about Awwww Monday. Aww! what a lovely face heheh! A mighty hunter is that kitten. I'm grateful they stay relatively small in comparison to us. Cute little fellow. I use to enjoy watching our older females cats on the farm late in the afternoon as they lay in tall grass waiting for that unfortunate mouse who dared to venture from his hiding place as darkness approached. Invariably the cat would spring and come up with the goods to take home to the little babies. Yup, those were the days of my youth. Funny how some things remind hidden in the id (subconscious) until something brings them back. Thanks for that image on this Monday! He looks like he is just waiting to pounce and get you I tell ya :) Hope you are having a great one! Definitely 'awww' worthy. :) Have a happy Monday! 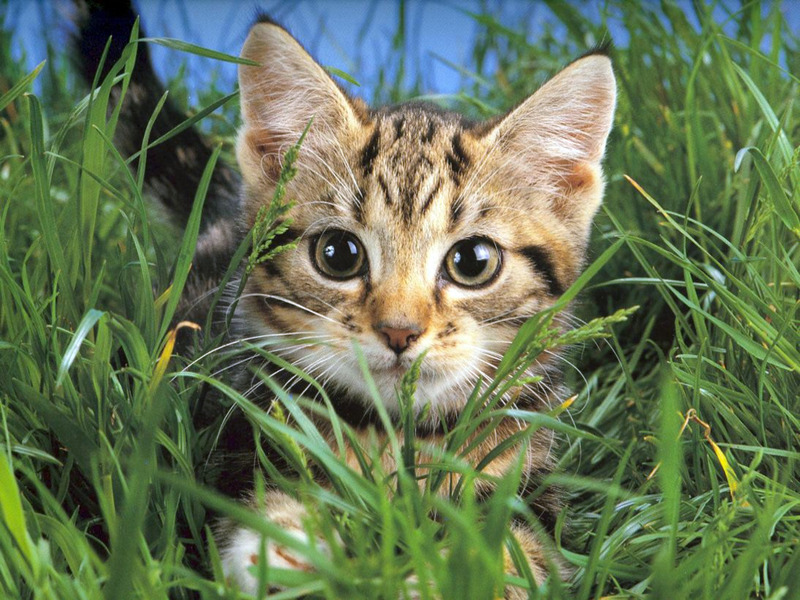 My first cat liked slinking in the grass to hunt. She also enjoyed just laying in the grass and soaking in the sun. My current cats don't get outdoors as much. I can imagine though them being as eager-eyed as the cat pictured here. Big cat in the jungle! Such a cute kitty! I love round faces and round eyes! Hope you had a wonderful weekend Sandee! Hi Sandee! Thank you for your note, you're work is eating all my time! :( so sad, sorry for not being around that much, but hopefully September is going to be much better. Peekaboo! I see my friend here. Meow! have a great week ahead! Yep, a little cutie peeking through the grass. Awe! What a sweet kitty!